61.5cm (24.5'') high, 67cm (26.25'') wide, and 15.2cm (6'') thick. Complete Cross head, dated to eleventh century. In the centre of the head enclosed in an irregular circular roll moulding is a quadruped. Its front leg is raised. Behind it there is a shafted cross set in a rectangular base with grooved mouldings. Above the animal's back there is a circular feature with a small central depression. 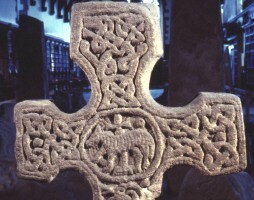 It is suggested that the animal is the 'agnus dei', the Lamb of God. On the horizontal arms there are two registers of interlaced pattern. In the upper arm there is a composition of two canines. Their tails are joined in a knot; their ear extensions interlink with their pointed front legs, and their back legs coil up and over their bodies. In what remains of the lower arm there is the upper half of a composition that has an animal with a canine head struggling in the coils of a snake. The snake's jaws grip the animal's ear.